Stephen W. Terrell's (MUSIC) Web Log: TERRELL'S TUNE-UP: I've Been to Mekonville and Back! TERRELL'S TUNE-UP: I've Been to Mekonville and Back! When The Mekons first emerged as a young, brash, ragtag, loose-knit art-school punk-rock band in Leeds, U.K. in those golden late ’70s, I bet nobody who heard or saw them — or even the band members themselves — ever envisioned that in 2017, hundreds of people from many nations would answer the band’s call to “destroy your safe and happy lives before it is too late,” and gather in rural England to celebrate the band’s 40th anniversary at a three-day music festival. But that’s what just happened. And I was there. About 90 percent of the people I know gave me blank stares when I told them I was going to England for a Mekons festival. That’s not surprising. The group has never had a really big hit. They haven’t even been on a major label in a quarter century or so. How many bands these days have eight members — including three or four lead singers — and feature fiddle, accordion, and oud? The Mekons sprang out of the punk world, but they went on to incorporate elements of folk and country music, reggae, and other sounds. Whether they are playing an original rocker, some mutated sea shanty, or a Hank Williams song, The Mekons don’t sound much like anyone else. 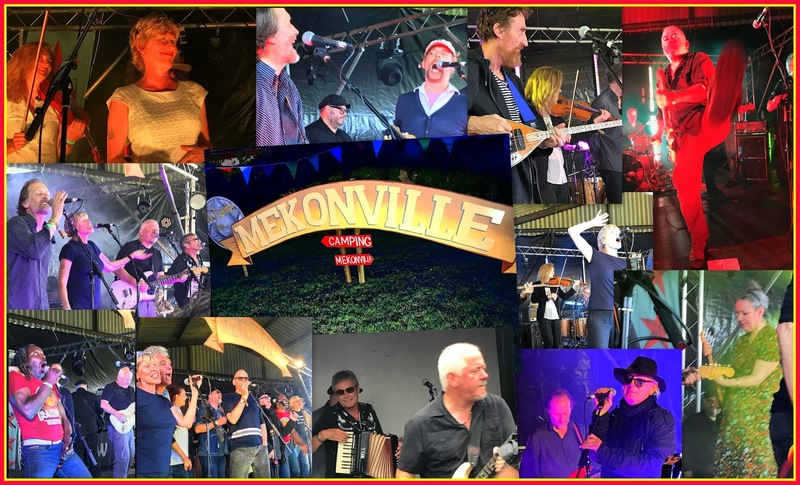 The 2017 Mekons played a set on each day of the festival. Their magical Friday night performance spotlighted the band’s (relatively) best-known songs like “I Have Been to Heaven and Back,” “Beaten and Broken,” “Millionaire” and, of course, their hard-driving battle cry, “Memphis, Egypt” (“The battles we fought were long and hard, just not to be consumed by rock ’n’ roll”), which they played during all three of their sets. The band did a couple of newer songs the first night, including “Simone on the Beach,” sung by Timms, one of the more rocking songs from their latest album Existentialism (for my money, the best Mekons album of this century so far), along with their latest single, a slow, dreamy “How Many Stars Are Out Tonight,” which features Greenhalgh on lead vocals and his kids singing backup on the choruses. This set could have been marred by the sound problems, as the amps for some of the instruments went off several times. But the band just made a joke of it and plowed through like pros. With the exception of “Memphis, Egypt” there were no repeats from Friday’s set list. The best songs here included Timms’ signature “Ghosts of American Astronauts,” “The Olde Trip to Jerusalem” — one of the group’s most intense latter-day rockers — “Sometimes I Feel Like Fletcher Christian,” performed in a mariachi-influenced style, and the rowdy “Big Zombie,” in which Bell’s accordion drives the almost Cajun-sounding tune. But the highest-energy number was a take-no-prisoners version of “Where Were You?” in which The Mekons were joined on stage by their road manager, emcee, and sometimes singer Mitch Flacko. Later that night on the main stage there was a punk set by the original 1977 Mekons. Langford (switching from guitar to drums) and Greenhalgh were joined by singers Andy Corrigan and Mark “Chalkie” White, guitarist Kevin Lycett, and bassist Ros Allen (who had her back turned away from the audience during virtually the whole show). I knew this was going to be good, but I had no idea that these guys would be this good. They ripped through their early songs such as “32 Weeks,” “Never Been in a Riot,” and, once again, “Where Were You,” this time with lead vocals by Chalkie and Langford pounding his drums as if he were auditioning for a spot with The Surfaris. Following a couple of country covers (“Help Me Make It Through the Night” and Hank Williams’ “Lost Highway”), Mekons past and present as well as other musicians who had performed at the festival took to the stage for one final rousing, messy, ridiculous “Where Were You?” with Mitch and Chalkie sharing lead vocals. Personally, I guzzled the spiked Kool-Aid served up by The Mekons years ago. And I took an even bigger gulp at the festival in Suffolk. I’m proud to be a member of this crazed congregation. And it was a true joy to be a citizen of Mekonville. Here's the 1977 Mekons with "Where Were You?"